Irene Osborne (Ingeborge Eichberg) was born in Koblenz, Germany in 1927. Her family- parents Joseph and Emmy Eichberg and sister, Ruth – were Orthodox Jews. After Kristallnacht and the arrest of Joseph, Emmy sent her daughters to France. Irene and Ruth lived as Protestants under false names with relatives in La Bastide-des-Jourdans in Aix-en-Provence until the arrival of the American Army in France in 1944. In 1946 Irene immigrated to the United States where she married Herald Osborne (Hans Oppenheim) and had three children. 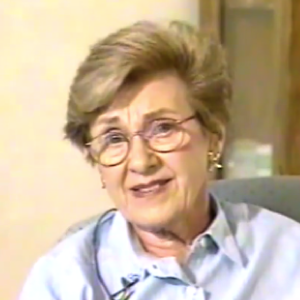 Irene moved to El Paso after the death of her husband in 1992.